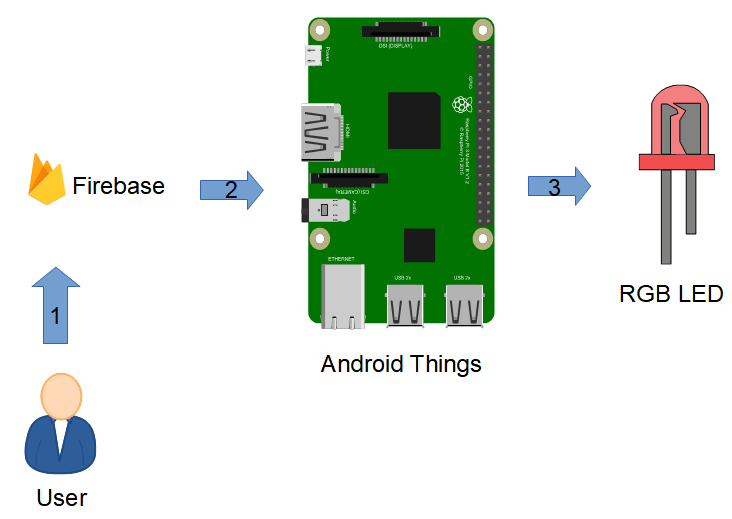 This practical guide about Firebase IoT, describes how to integrate Android Things with Firebase. To accomplish this integration, we will build a project that controls an RGB LED remotely in real time. In more details, through this Firebase IoT tutorial, we will describe all the steps necessary to integrate Android Things with Firebase. The final goal is controlling the RGB LED connected to Android Things using Firebase console, so that changing one or more values in the Firebase console will be reflected in RGB LED color change. This project demonstrates, moreover, how it is possible to exchange real-time data between Android Things and Firebase. As you may already know Android Things is a branch of Android OS therefore Android Things supports Firebase out of the box. Moreover, using this project, we can explain how to use Firebase in IoT projects. In this tutorial, we assume you are already familiar with Android Things OS and you have already installed it. If this is the first time you use Android Things you can read how to install the Android Things OS on your board. 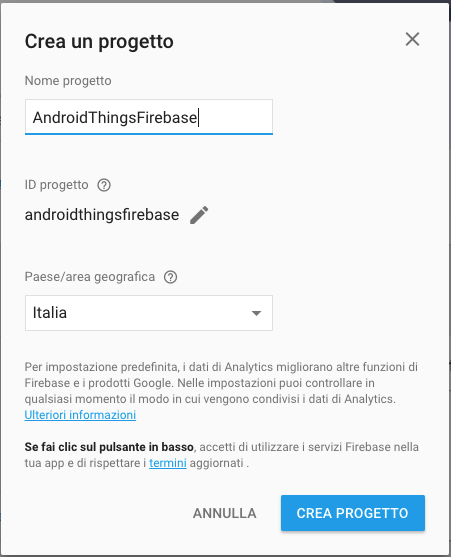 This Android Things project can be further extended so that we can integrate Android Things with Firebase exchanging different types of information. 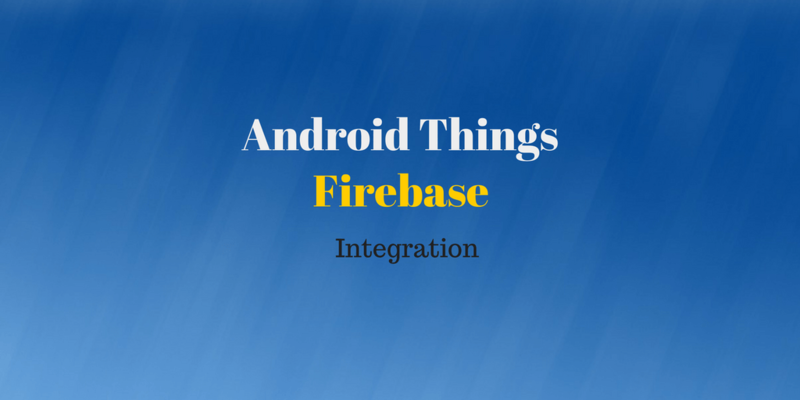 There are several scenarios where the synchronization between Android Things and Firebase plays an important role so it is important to know how to do it. Once we have connected Android Things to Firebase whenever we change a value in the Firebase database, the new value triggers an event so that the synchronization between Android Things and Firebase database takes place transferring the new value to the Android Things board that in turn set the RGB LED color. After you have followed the instruction during the Firebase project setup you are ready to start coding the Android Things IoT app. All the Firebase dependencies and configuration are now ready and we can dive into the details about integrating Android Things with Firebase. As described previously, in this Firebase IoT step by step guide, the Android Things app has to listen to the Firebase value changes and react to controlling the RGB LED. The RGB LED has 3 pins one for each color and we connect them to the Raspberry GPIO pins. According to the value in the Firebase database, the Android Things app turns on or off each GPIO pins controlling, in this way, the LED color. This app does not have a UI because the Android Things is controlled remotely. In order to create this Android IoT app, it is necessary to create a new Android Things project using Android Studio. If you are new and this is the first time you approach the Android Things you can follow this tutorial describing how to get started with Android Things. is portable on different boards. Anyway, for this tutorial, we can use the pin direct access because we are mainly focused on how to integrate Android Thing with Firebase. In this example, we suppose that if the value is more than zero then the PIN is on otherwise if off. Notice that we are using a common cathode LED, for this reason, we turn off the pin. Now you can play using the Firebase console changing the RGB values and notice that the LED change color. 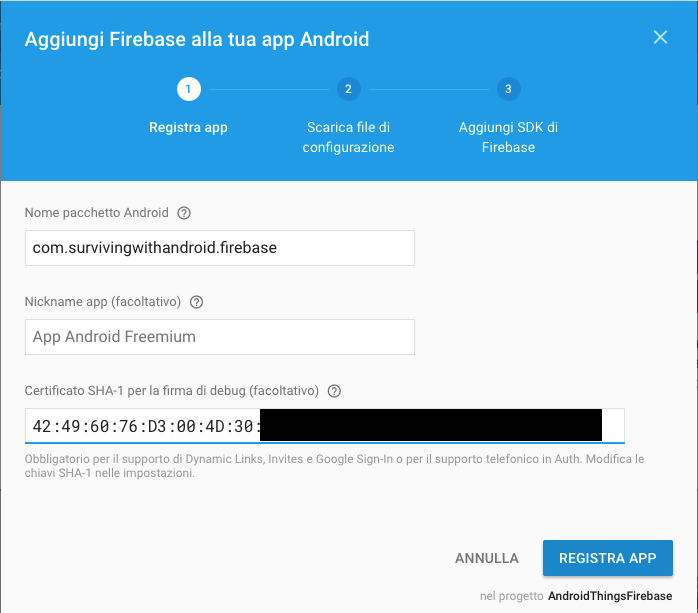 At the end of this article, you gained the knowledge about how to integrate Android Things with Firebase so that we can control in real time the Android Things board remotely. Once you have learned how to synchronize Android Things with Firebase, you can further extend this project and implement new features to control other kinds of peripherals. During this tutorial, you have explored how to use Firebase in IoT projects and how to configure Firebase so that we can synchronize it with an IoT device like an Android Things compatible boards.